From TV tournaments to the World Wide Web, the poker revolution is sweeping America. Thanks to its glitzy presentation on television, and the millions in prize money, it's the pastime of choice for high school and college kids. Update: In late 2006, Congress passed a new law dramatically restricting Americans' ability to gamble online. Read about this new law and the effects it's had on the U.S. online-gambling industry. Presenter James Silver gets addicted. "I had a credit card in my wallet, and a spare evening on my hands. In a casino city, that's a dangerous mix." Ryan, 23, runs up $20,000 in debt, and claws his way out; the hard way. Matt Murray is defying the grim odds of online poker. So far, he's made over $150,000 and is using those winnings to put himself through college. 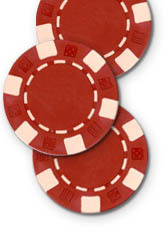 Poker nights on college campuses around the country are becoming nightly activities. Some students say losing money doesn't translate into losing interest. In fact, it may increase the attraction. For some, the temptation to gamble is too strong to walk away from. Often, they believe they're just one big win away from clawing their way out of ever-deepening debt. Researchers believe adolescents are particularly vulnerable to gambling addition. There also seems to be a strong link between early gambling and later drug and alcohol abuse. While colleges have numerous awareness programs about drug and alcohol addiction, none exist for gambling addiction. In fact, many colleges allow gambling companies to advertise on campus. It's getting easier for underage users to start gambling online, even though online gambling is technically illegal in the Unites States. Logging On and Losing Out was produced in collaboration with BBC Radio.